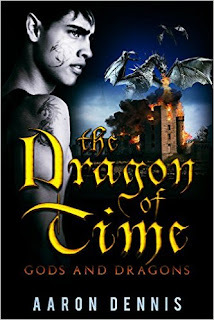 In a world where Dragons pose as Gods, one man with no past unearths their lies in the ruined kingdom of Alduheim. Scar, the mercenary, seeks only answers, but those who hold sway in the world of Tiamhaal would have him fight for lies. After defeating a man who claims he follows the real Gods, Scar grows even more curious of his origins. Is he truly this King Brandt of Alduheim? Were the Dragons really killed at the site of the old kingdom? And if so, how can they possibly be influencing the leaders of Tiamhaal? The premise of the book is based on a warrior who has lost his memories and is trying to find out his past. Along the way he discover more about himself and who he is. I found the start of the book to be rather slow and I wasn't instantly hooked. There just seemed to be too many names thrown in and I did get confused, but the story did pick up halfway through and I got the sense that the author grew into the novel both in terms of writing, world building and characterisation. Interestingly, the book reminded me a lot of greek mythology when it came to gods, goddesses and heroes. For a self published novel I found the book without any typos of spelling mistakes and generally well edited. I recommend this book for those who are interested in greek mythology but I do feel this author is still growing into his craft and so as a result the book feels more akin to a rough diamond than a polished one.